Microsoft ignored the Web for many years because their Windows 3.1 operating system didn't have the power to deal with it. With the release of Windows 95, Microsoft decided that they owned the Web. In order to confuse users into thinking Windows is the Web, Microsoft introduced one the biggest productivity killers ever created, Active Desktop. One of the effects of Active Desktop is "Web Style". With this configuration, Windows wastes a big area of screen space displaying a webpage containing useless information on the left side of every window. For example, the left side of the Control Panel informs you "Use the settings in Control panel to personalize your computer". Web style does provide thumbnail previews of files in a folder. If this is what you need, stick with Web style. But understand that creating these thumbnail previews really slows down your computer. For higher productivity, configure your computer for "Classic style". In Control Panel, open the "Folder Options" utility. On the "General" tab, set the radio buttons as shown below. 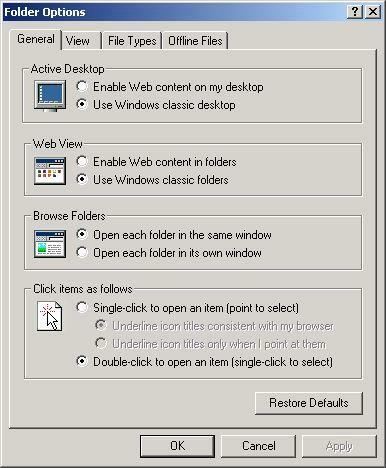 With Windows XP click on the link "Switch to Classic View". Why this annoying difference between windows XP and all other versions of windows? Because that's what you get When Microsoft releases a new version of windows, just some simple cosmetic changes. That's your "Upgrade".